I don’t stan for Ms Angela Davis. ‘Stanning,’ is both a recognition of our generation’s zeal for artists with whom we feel profoundly connected and an indictment of the breathless superficiality with which we fight their battles. As such, it lacks the requisite gravitas to describe the gratitude and love many of us we feel for a woman who has committed her artistic, intellectual, and bodily life to fighting for people who look like us the world over. I am lucky enough to have listened to her twice before, and to have studied her work in some depth. Still, when the opportunity to listen to her once more came up, I jumped at the chance. At a smooth 75 years of age, Ms Davis still has much to teach us about leadership, allyship and growth. Ms Davis appeared at London’s Southbank Centre as part of the annual Women of the World (WOW) Festival which celebrates International Women’s Day (8th March) across a weekend of workshops, performances, talks and activism, topping the bill with her participation in the ‘In Conversation’ events that are frequently the highlight of WOW. When a black female icon is In Conversation, the stubborn beige interior of the Royal Festival Hall transforms into a Womanist enclave of two thousand Michealas, Adoahs, Dianes, Zadies and Gugus. And it feels great. Kudos to the Southbank Centre and WOW for continuing to create spaces for black girls to feel magical all year round, every year. I have attended three of these in the last twelve months. Chimamanda and Reni’s side-eyes and solidarity were infinitely gif-able and Roxanne Gay was unexpectedly heart-warming. (It’s still too soon to comment on the pain of Mobama Ticketing Travesty 2018.) This was the best yet. We should all know by Ms Davis’ history, but unlike many of her contemporaries, she remains highly relevant. Two months ago, the Birmingham Civil Rights Institute of Alabama rescinded an award they had previously intended to present to Ms Davis. Their cowardly move followed pressure from pro-Israel individuals and organisations who are opposed to Ms Davis' continued and multifaceted support for Palestinians. The impassioned response from Jewish and black communities worldwide and the protest resignations of several of its own board members forced the institute to rescind its rescinding. Ms Davis’ explicit commitment to self-critique, enduring wit and her intentional privileging of younger voices is Black Feminism at is best. She killed it, with kindness. On intersectionality: Ms Davis laments how often saying the word now stands in for doing the work it requires of us. On the capitalist co-opting of liberation language: She is unphased. To her it means we've got them listening, now let's be even more radical and keep them on their toes. On reparations: the conversation is too simplistic; cash does not solve problems, offer repair through access to decent education and healthcare. The weakest link in these events is often the person with whom the headliner is conversating. The host has to strike a tricky balance between keeping a brilliant and often sprawling mind, that may be better at communicating in text than in person, focussed and engaging while giving them the space to shine. Jude Kelly struggled with this. She was determined to provide Ms Davis with meaty questions worthy of her intellect. In attempting to do so however her questions became overlong, convoluted and engaged in the ultimate sin – taking up Ms Davis’ airtime with her own voice and perspective. Jude Kelly is a brilliant artist deserving of our attention, but nobody in the audience was there for that. This approach also jarred with Ms Davis’ easy, phlegmatic charm. In contrast, the audience’s well thought out and cleanly communicated questions generated a warm buzz, that animated Ms Davis. She historically, unlike other prominent black female cultural critics, has not rejected feminism for its invariable centring of white women. As such, she met Judy Kelly's earnest questioning with respect and warmth. The anger we often feel when White Feminists take up the little space left for us to us is rarely productive. Ms Davis repudiated this unintended centring without breaking a sweat or compromising her values. I doubt my capacity to follow suit, but she demonstrated to us all that humility is not equal to meekness; it is the antonym of arrogance. In contrast, bell.hooks’ criticism of Beyoncé and Cornel West’s attempted takedown of TaNehisi-Coates are recent examples of established black luminaries criticising popular creatives and wholly missing the point. Not that contemporary artists and thinkers should not be taken to task, but there is a clear tension between the old guard and the new that is rooted in a politics of respectability that both hooks and West would normally reject. Instead they undervalue the investment young black people – particular those who identify as women - have made in these new voices, while condescendingly questioning our competence to meaningfully critique them: you think you like them because you don’t know better. Davis makes a compelling case in both her language and her actions, for breaking free of generational dynamics and creating space for younger voices. Our generation is one without an honour code. Our online battles are personal and visceral. The unending and insidious nature of racism and sexism mean that we have to defend our right to defend our rights, daily. It often makes us, as black women, weary. It makes me, personally, irritable and increasingly intolerant to those who stay vigilantly ignorant of the suffering of others. 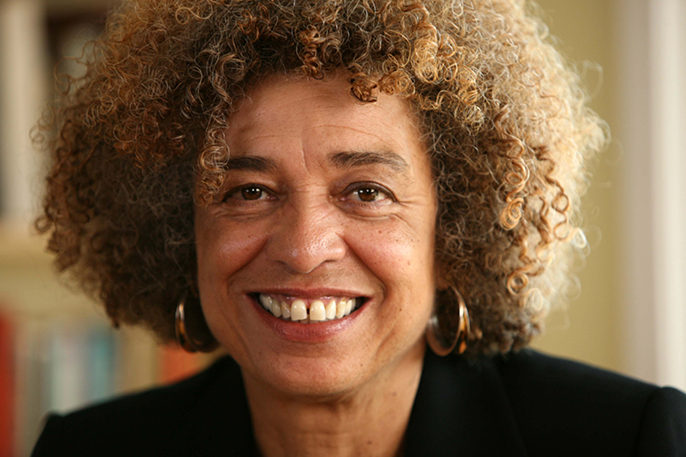 No living icon I can think of has experienced embattlement as Ms Angela Davis has. A post-McCarthyism Communist, a Black Panther without the social capital a Marvel investment retroactively affords the membership, a fugitive from the law, a named enemy of Reagan, Hoover and Nixon; she is all these things. And yet, there are no signs of irritability in Ms Davis. She is luminous with the energy of others. In her, there is grace to be found. Most compelling to me was her capacious – a word she repeated throughout the night and I back-pocketed for your reading pleasure -humility. In a context where one’s ability to amplify their message is tied inextricably to one’s capability for self-promotion, it is easy to forget the power of these qualities. Ms Davis’ explicit commitment to self-critique, enduring wit and her intentional privileging of younger voices is Black Feminism at is best. She killed it, with kindness.